BY DUANE A. VACHON, PH.D. John Duncan Bulkeley was born on August 19, 1911 at New York City. He grew up on a farm in Hackettstown, New Jersey and graduated from Hackettstown High School. Bulkeley was not able to gain an appointment to Annapolis from his home state of New Jersey. Ultimately he was able to obtain an appointment from the state of Texas. Due to budget constraints, only the upper half of the 1933 Academy class received a commission upon graduation. John Bulkeley, noted early on for his intense interest in engineering, joined the Army Air Corps. Like the flying machines of the day, he landed hard more than once. After a year, and because the President and Congress permitted additional commissions in the Navy (as a government plan for additional jobs), Bulkeley gave up flying for the deck of a cruiser, the USS Indianapolis (CA-35), as a commissioned officer in the Navy. 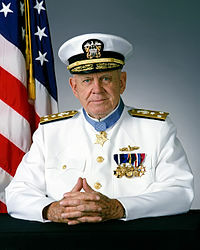 Bulkeley retired with the rank of Vice Admiral in United States Navy and was one of the most decorated naval officers. Bulkeley received the Medal of Honor for actions in the Pacific Theater during World War II. He was also the PT boat skipper who evacuated General Douglas MacArthur from Corregidor in the Philippines and commanded at the Battle of La Ciotat. Bulkeley charted an interesting course in his early years and was recognized early on by the Navy’s leadership. As a new ensign in the mid-1930s, he took the initiative to remove the Japanese ambassador’s briefcase from a stateroom aboard a Washington-bound steamer, delivering it to Naval Intelligence a short swim later. This bold feat, the first of many in his life, did not earn him any medals, but it did get him a swift one-way ticket out of the country and a new assignment as Chief Engineer of a coal-burning gunboat, the USS Sacramento (PG-19), also known in those parts as “The Galloping Ghost of the China Coast”. There he met Alice Wood, a young, attractive English girl, at a dinner party aboard HMS Diana (H49). In China, they witnessed the invasion of Swatow and Shanghai by Japanese troops and the bombing of USS Panay (PR-5), the first US Navy ship sunk in World War II. At the beginning of World War II, Bulkeley was a lieutenant in command of Motor Torpedo Boat Squadron Three, a Philippine-based detachment of six motor torpedo boats. He hit his stride as a daring, resourceful and courageous leader. He picked up General Douglas MacArthur, his family, and his immediate staff, who had been ordered to flee the Philippines, and took them aboard PT 41 and other 77-foot (23 m) motor torpedo boats through over 600 nautical miles (1,000 km) of open ocean. On arriving at Mindanao, MacArthur said, “You have taken me out of the jaws of death. I shall never forget it.” Bulkeley earned many of his array of decorations while in command of that squadron and a subsequent one. The Korean War was Bulkeley’s next conflict. He was put in command of Destroyer Division 132. After the war, he was Chief of Staff for Cruiser Division Five. Because the North Koreans did not have a large navy and the Chinese were not committing their own, few naval battles were fought in the war. Destroyer Division 132 focused on providing naval gunfire support for troops on shore, but also, on several occasions, the destroyers engaged enemy shore batteries. Throughout the conflict, the North Koreans failed to inflict serious damage on any American warship deployed. In the early 1960s, Bulkeley commanded Clarksville Base, Tennessee, then a tri-service command under the aegis of the Defense Atomic Support Agency. Having lost none of his wartime daring, Bulkeley was known to test the alertness of the Marines guarding the base by donning a ninja suit, blackening his face and endeavoring to penetrate the classified area after dark without detection. This was a dangerous endeavor, as the Marines carried loaded weapons. Ever popular with his men, who both respected and admired him, Bulkeley could be seen driving around the base in his fire-engine red Triumph TR3 sports car with a large silver PT boat as a hood ornament. Promoted to Rear Admiral by President John F. Kennedy, who commanded PT-109 during World War II, Bulkeley was dispatched to command the Guantanamo Bay Naval Base in Cuba, where he met Cuba’s threat to sever water supplies in response to the Bay of Pigs invasion and other assaults by ordering the installation of desalinization equipment to make the base self-sufficient. For extraordinary heroism, distinguished service, and conspicuous gallantry above and beyond the call of duty as commander of Motor Torpedo Boat Squadron 3, in Philippine waters during the period 7 December 1941 to 10 April 1942. The remarkable achievement of LCDR Bulkeley’s command in damaging or destroying a notable number of Japanese enemy planes, surface combatant and merchant ships, and in dispersing landing parties and land-based enemy forces during the 4 months and 8 days of operation without benefit of repairs, overhaul, or maintenance facilities for his squadron, is believed to be without precedent in this type of warfare. His dynamic forcefulness and daring in offensive action, his brilliantly planned and skillfully executed attacks, supplemented by a unique resourcefulness and ingenuity, characterize him as an outstanding leader of men and a gallant and intrepid seaman. These qualities coupled with a complete disregard for his own personal safety reflect great credit upon him and the Naval Service. On April 6, 1996, Bulkeley died at his home in Silver Spring, Maryland, at age 84. Bulkeley was buried at Arlington National Cemetery. His grave is located in section 5 site 129-9 LH.